Team Cicero Costha had an incredible performance this weekend at the 2018 IBJJF European Championships. The team won the adult team title with 84 points and besting some of the biggest teams on the planet in the process. 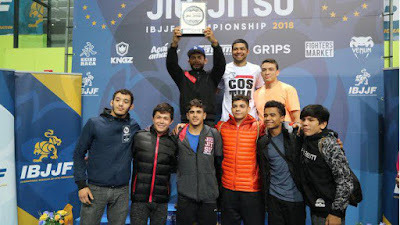 Their squad of killer purple belts (including Thalison Soares, Jonas Andrade, Diego Batista, and more) contributed to three closed out divisions (gold and silver medals). Vinicius Liberati took double gold (weight and absolute) in the blue belt division, and a closeout between Hiago Geroge-Joao Miyao in the light-featherweight black belt division secured two more gold and silver medals for the team.